This article is about the Series 11 minifigure. For other uses, see Yeti (Disambiguation). Yeti is a Minifigures Series 11 minifigure released in September 2013. The Yeti has a white body, as well as white arms. His head is a new mould that covers most of the torso, which is also white with a light blue face. He has black eyes with white pupils, and pale yellow teeth. His hands are Medium Blue. His legs are white, and have light blue fur printing on them. His torso is also printed with light blue fur designs. He carries a Transparent Fluorescent Blue popsicle. 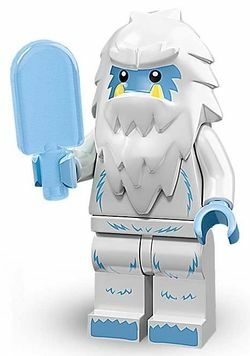 He is one of the only two minifigures ever to have medium blue hands, the other being the Scientist (which is also from Series 11), the series that Yeti is in. His head mould was designed for him and was exclusive to him, until it was used for Breezor and Square Foot in 2015. He is the only Series 11 minifigure sticker in The LEGO Movie: Ultimate Sticker Collection. Once upon a time, the Yeti was barely more than a legend. Dwelling all alone up on his snowy mountaintop, he was rarely glimpsed by travelers, and those who did spot him were even less often believed. The Yeti himself was starting to think that he might just be a myth. But that changed the day he looked himself up on the internet. Everyone seemed to be talking about him there, and they knew all about him – from his favorite foods to his foot size. He was famous! Now that he knows he’s a celebrity, the no-longer-shy Yeti is just waiting for crowds of new friends to arrive. He can’t wait to meet them! This page was last edited on 24 June 2017, at 19:48.